However, the operation of Bandicam is closely related to the performance of a system. The recording of streaming video requires a lot of system resources (CPU, GPU, RAM and the like). If the performance of the computer is not good enough, the computer will slow down or there will be a skipping phenomenon. To reduce lag while recording, use a desktop instead of a laptop, reduce the video resolution of the recording target, reduce the video size, FPS, video quality and try the hardware-accelerated H.264 encoder of Bandicam. If your game has an option to change the video/display settings, reduce the video resolution and play in windowed mode instead of full screen. It will increase the FPS and reduce the lag. Reduce the Video Size from "Full Size" to "Half Size"
If the current Size value, which is "Full Size" as shown above, is changed to "Half Size" in the options of the 'Settings' section under the 'Video' tab, it would degrade the quality of the video but help prevent the computer from slowing down. Reduce the FPS from "30" to "15"
If the current FPS value, which is "30.000" as shown above, is changed to "15.000", it would record the video at 15 frames per second, and help mitigate the slowing down of the computer system. Reduce the Video Quality from "80" to "50"
If the current Quality value, which is "80" as shown above, is changed to '50', the quality of the video will be lowered, but help mitigate the slowing down of the computer system. If the current Codec value, which is "MPEG-1 and MPEG-1 L2" as shown above, is changed to 'Motion JPEG and PCM', the size of the video will be increased, but help mitigate the slowing down of the computer system. If you are using the latest grahpics card or Intel CPU, try "Nvidia® CUDA/NVENC H.264 Encoder", "Intel® Quick Sync Video H.264 Encoder", or "AMD VCE H.264 Encoder" of Bandicam. 4. If you use an NVIDIA graphics card, select "Prefer maximum performance"
1) If you use the 'Game Recording Mode', set the game to maximum performance at the NVIDIA Control Panel. 2) If you use the 'Screen Recording Mode' or 'Device Recording Mode', set Bandicam to maximum performance. - If you put your graphics card into the secondary slot, please plug your graphics card into the primary graphics card slot. If you use 'Game Recording' mode, try 'Screen Recording' mode. If you use 'Screen Recording' mode, try 'Game Recording' mode. If you use the "Two Sound Mixing" option with USB headset, disable the "Two Sound Mixing" option of Bandicam. 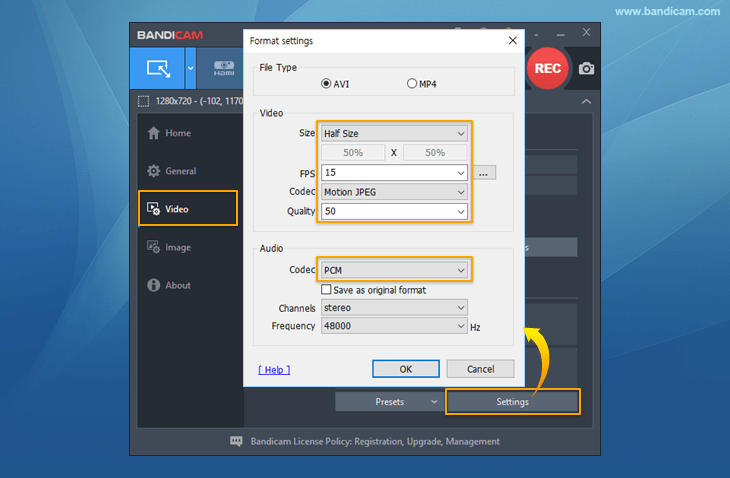 - If you have upgraded your OS to Windows 8 or Windows 10, you can reduce lag by using the enhanced capture method in the 'Screen Recording Mode' of Bandicam. - If you still have the problem, you may upgrade your graphics card, CPU, and RAM to increase the performance of your computer.